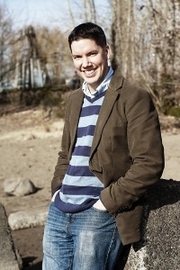 Ian Doescher is currently the Creative Director at Pivot Group LLC in Portland, OR. He has B.A. in Music, a Master of Divinity, and a Ph.D. in Ethics. 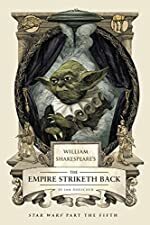 His first book was the New York Times best seller, William Shakespeare's Star Wars, released in July 2013, and its sequel, The Empire Striketh Back is out this month from Quirk Books. In the span of one summer, Ian watched the original Star Wars triology for the 50th time or so, read Pride and Prejudice and Zombies, and attended a Shakespeare festival, where he saw a funny, gay-marriage-themed, modern adaptation called The Very Merry Wives of Windsor, Iowa. Thus, the idea for William Shakespeare's Star Wars was born. While it's generally safe to assume that everybody and their kid brother knows the gist of the original Star Wars trilogy at this point, some of our readers may not be so familiar. What is the original trilogy about, in your mind? Overall, I would say it's the tale of how a group of rebels overthrew a mighty, power-hungry Empire. Within that, it's the story of a man who has a transformation from innocence to pain to evil to redemption (Darth Vader), and other young people who are learning what destiny has in store for them (Luke, Leia, Han). Along the way we get to meet some interesting and hilarious characters. There's my elevator pitch for the series! You said in an earlier interview at Giant Freakin Robot that you've seen Star Wars 40–50 times at this point. How many times did you watch Episode V while writing this book? It wasn't so much a matter of watching it over and over as it was a matter of watching little bits at a time. I would watch a little snippet of the movie—a few seconds—to remind myself of the dialogue, then look at the script online if needed. After that, I would translate the lines into iambic pentameter, see if I could add any references or give a character an aside or soliloquy, and then move on. So I watched the movie once, very, very slowly. After the success of William Shakespeare's Star Wars: Verily, a New Hope, was it easier or harder to write The Empire Striketh Back? What was the hardest part of writing it? It definitely was easier to write The Empire Striketh Back, if only because at this point iambic pentameter is much easier to write since I've had so much practice. I now have this strange (and useless) ability to recognize iambic pentameter when I hear it in normal everyday conversation, in a movie, and so on. The hardest part about writing Empire was that I had roughly half the time to write it than I did for Verily, A New Hope. Yes, much more with Empire than with Verily, A New Hope. With the first book, I wasn't really imagining it as something that would ever be performed or something people would want to perform. But after hearing from theater groups around the world who want to perform the first book, staging was very much on my mind the second time around. Consequently, I think I made better use of what you would actually find in an Elizabethan stage -- a balcony, the overall breadth of the stage, etc. You hinted in the afterword that Han and Leia's dynamic turned toward being similar to that of Benedick and Beatrice from Much Ado About Nothing. Did you model Darth Vader off of any particular Shakespearean character(s)? You did a great job of giving him more depth than we see on the screen in the original movie. I don't know that Darth Vader is necessarily modeled after a particular character, but he's definitely a sweeping tragic figure along the lines of King Lear or Othello—someone who is driven by external forces to push away those he loves, only to find out at the end of his life how wrong he was. I think the six-movie Star Wars story could easily be called The Tragedy of Anakin Skywalker. In this book, we finally meet Yoda, and you had a very interesting way of dealing with his idiosyncratic speech patterns (Yoda speaks strictly in haiku). How did you come up with this idea, and was it harder to write Yoda's lines than any of the other characters? After the first book, many people said to me, "They all sound like Yoda now!" I knew I had my work cut out for the second book in terms of what to do with Yoda. None of my three original ideas—using modern speech, using his lines verbatim, or using even more antiquated speech (something like Chaucer)—really moved me. I was jogging one morning—always a good time to think—when the idea of haiku came to mind, and instantly felt right. Luckily, Quirk Books and Lucasfilm agreed! I don't know that it was harder to write Yoda's lines, just a different way of checking my work (5-7-5 syllable pattern instead of iambic pentameter). It sounds like it was a very unique and fun adaptation of The Merry Wives of Windsor that got you to thinking about this mashup in the first place. What is your favorite Shakespeare play or adaptation, and why? My favorite play by itself is probably Hamlet, because I know it better than any other play. My favorite film adaptation is still Kenneth Branagh's Much Ado About Nothing, which I watched over and over in high school. My favorite theatrical adaptation of a play is probably a production of The Tempest I saw in college, because they staged it around our college's Olympic-size pool, which was a very creative setting for that play. 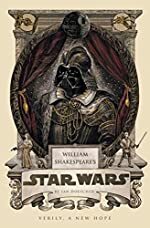 As the child of two teachers, I couldn't help notice that there's already an educator's guide for William Shakespeare's Star Wars, which is excellent! When you were writing the books, did you imagine this would be a new way to get students/kids interested in Shakespeare? I certainly hoped so. First and foremost, the books are written for people to enjoy and have fun with. But secondarily, if there's a chance my books can help students get into Shakespeare, that's a dream come true. I've had the opportunity since the first book came out to speak with several classes who are reading the book before they read real Shakespeare, and it has been incredibly rewarding to hear them say that they are eager to read something like Romeo and Juliet after their experience with William Shakespeare's Star Wars. Writing songs for the books has been fun, and of course I sing them to myself as I do it—I've written melodies for each one in my head. I think my Ph.D. in theology and ethics maybe comes to play in some of the passages where I'm talking about how characters think of the Force. Also, writing a dissertation definitely helped give me the confidence that I could write something book length. I know this is a question about the previous book in the series, but I have to ask: as a longtime Star Wars fan, surely you know that Han shot first. However, in the brief duel with Greedo in Verily, a New Hope, you wrote: "They shoot. Greedo dies." Why did you decide to write the scene more ambiguously? Throughout this process, there have been moments where I've walked a fine line between what fans want and what Lucasfilm treats as official. So, the 1997 rerelease of Star Wars, in which Greedo shoots first, is for better or worse what Lucasfilm now considers the canonical version. I assume their reasoning is that a good guy wouldn't shoot a bad guy in cold blood, even under threat. But I also know fans (like me) think that's silly. So treating the scene ambiguously was my way of presenting the Lucasfilm version with a nod to readers that hey, I know what you're thinking. What was your favorite speech or scene to write? In all three books I wrote scenes for two Imperial guards, where they essentially have a conversation about some strange aspect of the Star Wars plot (but as characters within that plot). In the first book, this idea came to me from the two stormtroopers who stand guard outside the Millennium Falcon, after it is pulled into the Death Star. In the second and third books, I just added these scenes without any referent from the actual movie. They were great fun, though, because it's my chance as a fan to poke fun at some of Star Wars' oddest moments: did no one of the Empire think the rebels might be in that ship? Does anyone wonder why there are these huge, gaping holes leading to nowhere everywhere they look? That's the dialogue from The Empire Striketh Back. You'll have to wait to see what it is for the third book! I almost always write late at night, after my two sons are asleep. I'm not necessarily a night person, it's just the one part of the day I have free. Often I write at my kitchen table, or at my desk, or in bed—occasionally at a coffee shop on weekends when I can sneak away for a few hours. I've gotten very good at turning out distractions while I write. Consequently, the whole world is my writing studio. What is your own library like? What sorts of books would we find on your shelves? There's a lot of religion and theology on my bookshelf, due to my Ph.D. program and the fact that both my spouse and I studied religion. There's also a lot of fiction—I love good novels. David James Duncan, Ann Patchett, Tana French, Zadie Smith, Ann-Marie MacDonald, Sena Jeter Naslund, Barbara Kingsolver and Stephen King are all favorites. I also love creative nonfiction, and will read on just about any topic if it's an accessibly written book. I'm just finishing The Complete Stories of Sherlock Holmes, which has been fun. Having been published through Quirk Books, I've been introduced to some of their authors and have recently read Ben Winters's Last Policeman series and Ransom Riggs's Miss Peregrine's Home for Peculiar Children. The sequel is sitting on my desk right now, and I can't wait to dive in. What's next for you once you've finished work on The Jedi Doth Return? Great question! There has been talk about adaptations of the Star Wars prequels, though I don't know if there's a market for all three. Eventually I would like to move away from Shakespearean parodies, but would happily write William Shakespeare's The Godfather or something similar if I were asked to. Right now, in my spare time, I am working on a first novel. The plot of the new novel is something you can imagine coming from the pen of the author of William Shakespeare's Star Wars. And that's all I'll say for now! Reading this book (and its predecessor) was an absolute delight, and I'm very much looking forward to the third installment. Can you give us any teasers for what we can expect? Expect more songs and more creatures speaking, expect something a little different and unusual for the Ewoks, expect to hear from a beloved minor character, and expect Jabba's band to get a little funky (Elizabethan funky). Return of the Jedi is my favorite of the three Star Wars movies, and I enjoyed writing its adaptation immensely.